« Cookbook writing class in September – there’s still room. Tubers, beans, and leaves of the Jicama plant. For a few years I had a wonderful job in lower Baja, Mexico working outside of San Jose del Cabo, in the mountains. The project was the dream of the former leader of the band, Tangerine Dream. He wanted to make a retreat where, just for example, the dining room tables were designed in such a way that people couldn’t easily make eye-contact with one another, so that they were, in effect, alone with their thoughts. What was wonderful about the job was not that so much (I like contact!) but being able to go to Baja every spring, to work with the wonderful and ingenuous Mexicans who could always figure out how to do difficult things with few materials, to work with rastra blocks of our buildings, and to learn about plants. I spent a lot of time with a botanist from the area who was showing me some of the native plants we might use in the spa kitchen. He would often say that jicama was a legume. A bean. I thought he was teasing me. 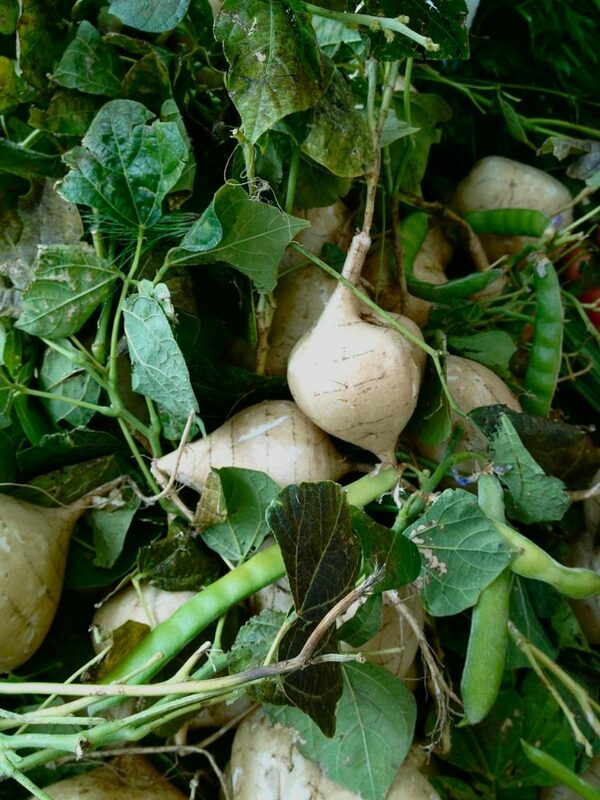 This issue was set aside for many years until one day, recently, in the Santa Monica farmers market I saw a stand of greens, bean pods, and jicama roots, all entwined and attached to one another. The botanist was right. Jicama is a bean! The brown papery covered part that we mostly eat is a swollen tuberous root. If you look at jicama images on line, they never show the beans, only the tuber. But here’s an image that shows all parts of the plant. It’s a bit chaotic, but if you look, you can make out the beans and the roots among the leaves. I’m not saying you should eat the beans – I’ve read that the leaves have a toxic element so maybe the beans have it too. Plus there are other beans to eat. Mostly this is just a curious bit of information. Enjoy!